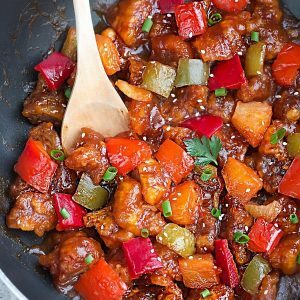 Sweet and Sour Pork – this is the perfect homemade version of the popular Chinese restaurant takeout dish. 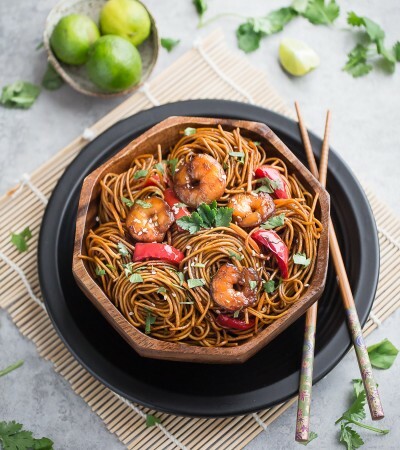 No need to order take-out anymore, this quick and easy version is so much better! 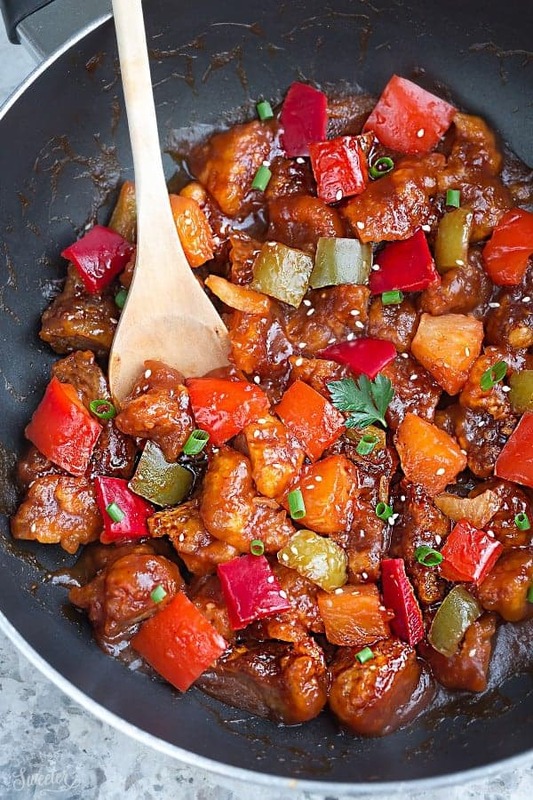 My dad used to make the best sweet and sour pork. It was his specialty and it was one of those dishes that would get us running to the table every.time. 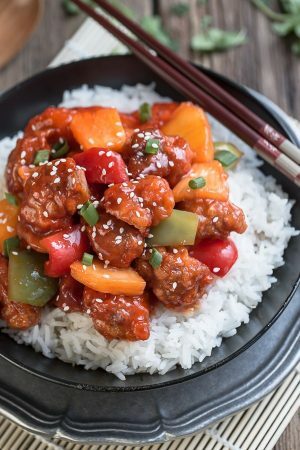 It was always perfectly crispy on the outside while the meat stayed nice and tender packed with a flavorful sweet and sour punch. It’s now one of my husband’s favorite dishes that he used to get for lunch when he worked in the city.Now that we moved to a smaller town with less choices for takeout, I started recreating his favorite takeout dish at home. I love making our favorite takeout dishes at home because you can completely customize them with whatever ingredients you have on hand. 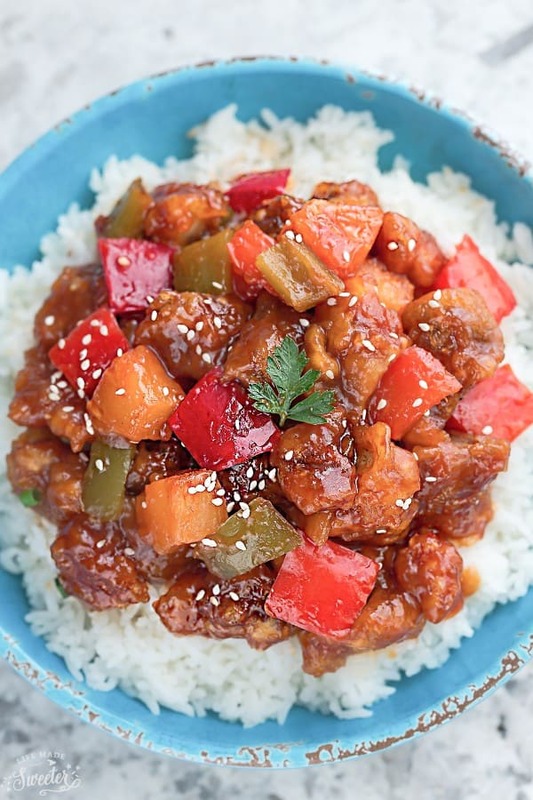 The flavors are spot on amazing and he says it’s even better than the restaurant version! We start off by marinating the meat and then coating it in some flour along with other seasonings. Next, we fry the pieces in batches until it gets perfectly crispy. Add in your favorite veggies – in this case we use red and green bell peppers, pineapples and some green onions tossed in at the end. 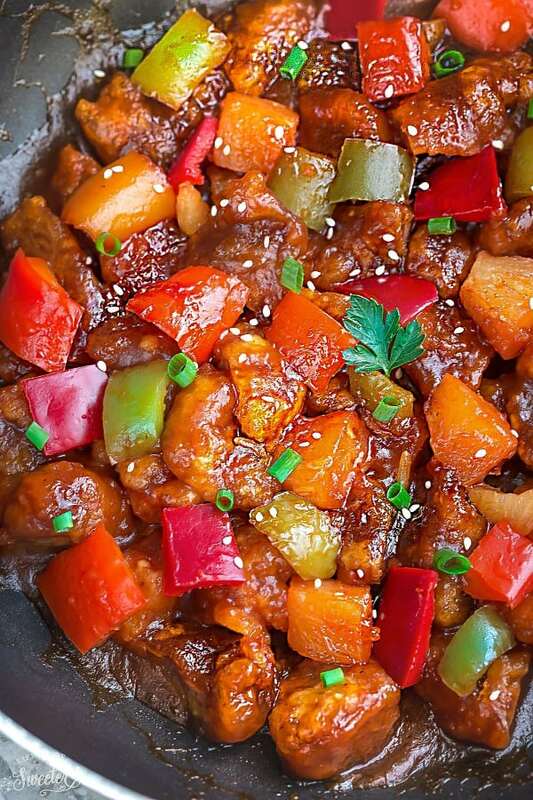 The authentic sweet and sour flavors are perfectly balanced with the crispy pieces of meat and crispy vegetables. 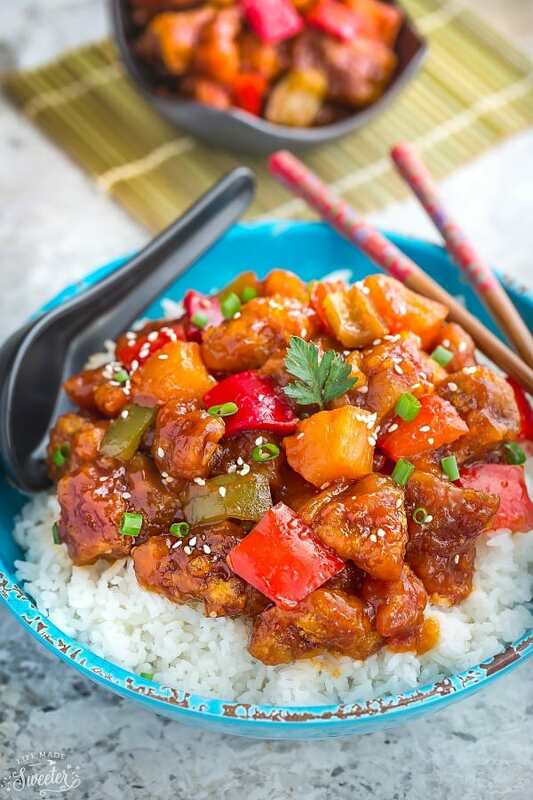 No need to order take-out anymore, this easy and delicious sweet and sour pork is coated in a mouthwatering sweet and sour sauce prepared with simple ingredients. Cut the pork tenderloin into pieces and marinate pork for 20 minutes. Heat up a skillet or frying pan and fill with the cooking oil for deep frying. Heat up another frying pan or wok on medium and add 1 teaspoon of oil. Add the garlic once the oil is heated up and stir-fry for about 1 minute. Add the chopped bell peppers and pineapples and stir-fry for another 4-6 minutes depending on how crisp you want the vegetables. Add the sauce and let it come to a boil. 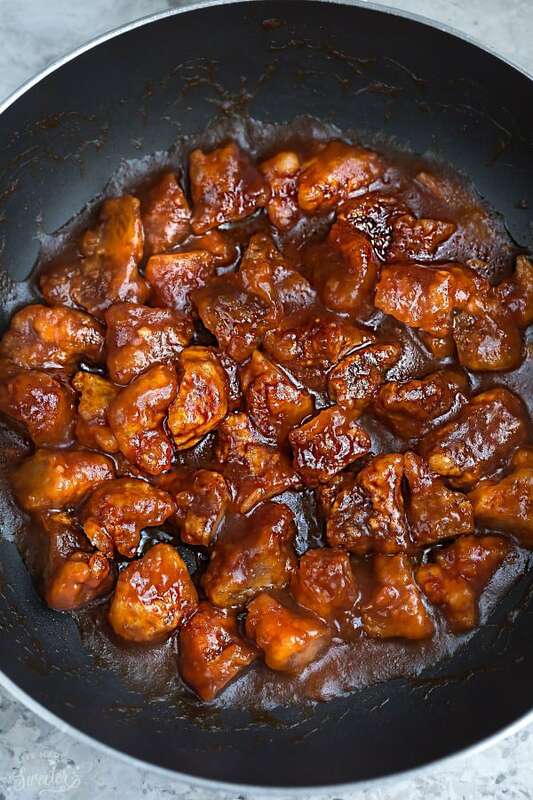 The sauce will thicken up and you can adjust or add in more seasonings according to your taste. Add the pork and mix all the ingredients together. Optional sprinkle some sesame seeds and cilantro and serve with or over white rice. 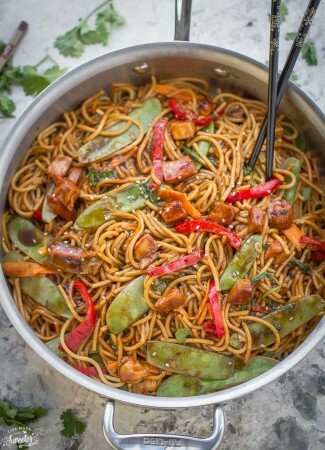 Follow Life Made Sweeter’s board Asian-Inspired Dishes on Pinterest. This dish looks good. Thanks for the recipe and step-by-step photos!! !